Glenn Irwin celebrates his Superbike double at the North West 200. There was no stopping Glenn Irwin on the PBM Be Wiser Ducati. 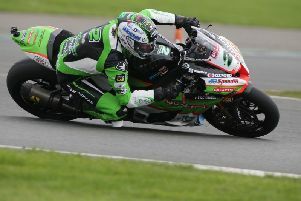 Alastair Seeley won three races in all to increase his record tally to 24 victories. Yorkshireman James Cowton sealed his maiden North West 200 win in the Supertwins race for Cookstown team McAdoo Racing.